First Line of Attack - Kill grubs in your lawn and garden soil before they can develop into adult beetles--before the middle of June when they usually emerge from the soil. This will reduce the population of beetles this year and next year. Products such as Merit, a granular insecticide to spread on turf and predatory nematodes, which are diluted in water and sprayed on the lawn, kill grubs. Neither product has any adverse effects on other soil life. Because many adult beetles will still fly onto your property, hand picking or using an insecticide will probably be necessary. Insecticide Alert: Avoid using any grub-killing insecticide containing granular diazinon on your lawn. While this product is effective in killing beetle grubs, it is known to kill songbirds, ducks, and geese who mistake it for food if it is allowed to sit on the surface of turfgrass or soil. It has been banned from use on public golf courses for that reason. 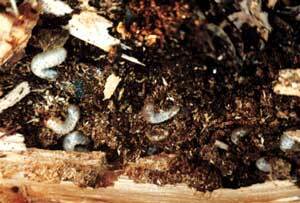 Click here for more information on Dealing With Grubs. There are a number of techniques and products available for controlling Japanese beetles. We present those solutions in three groups, do-it-yourself solutions using no insecticides, using natural insecticides and using synthetic insecticides. All solutions presented are considered safe by our authors for use in the home landscape. There are some products on the market that we do not recommend because so many effective options exist that are less toxic to the environment.